Youngest Granddaughter Paige, who is 10) is wearing a pink cast these days.........haven't heard yet what she did, but I made her a card which should get a giggle from her. This week the Stampotique Challenge #SDC 171 is Favorite Colors. I can honestly say that if it's distress inks, they ALL are my fav's! I tend to reach for any and all of these inks, as I believe all the colors go together. And, as you can see.....I used enuf of them here. I haven't posted in a while, been busy nursing my leg (yes 4+ months after replacement!, YIKES....will this ever end?) And, re-doing the studio. I can't wait to share photos when it finally gets organized. Too much stuff for 1 room, lol. I used HORSE, one of Roc Nicholas' stamps, dressed him up a bit, to suit my mood. The background was made with a stencil and sponged ink. He even is starting a beard for Movember! Oh yea...he even talks! Guessin' you can see my mood has picked up....that's a good thing! So cute, she'll love it ! Especially his pink cast ! Fabulous fun card, she will of course love it. 4 + months, that seems such a long time. You poor soul. How cute! Love the bright colors, background and added doodles! I'm sure she'll love it! This is adorable, Gerrie! It will certainly cheer her! 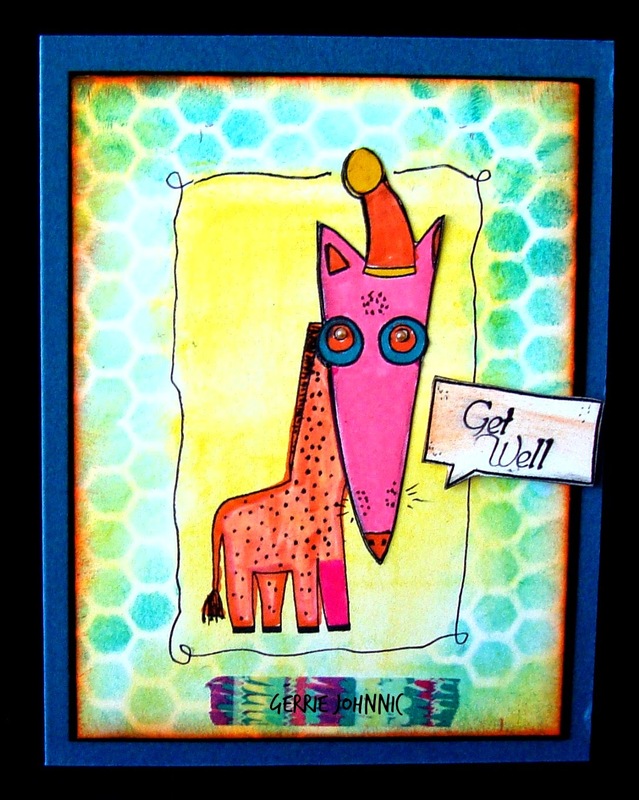 Thanks for participating in the Stampotique Designers' Challenge! Cute GF and I know your DGD loved it love the cast and your colors ROCK....glad things are getting better. Thanks for joining us at the Stampotique Designers Challenge. That's so cute! Thanks for joining us again at Stampotique this week.